Chicken adobo! I learned this recipe from my long time reader Josephine during my Gapshida trip in the Philippines! It was a great chance to meet her face to face because she had already been sharing her amazing Korean food photos with me and my other readers for years. Her husband Cyrus volunteered to be our cameraman. It was hot day, but also a great opportunity for me to meet such an avid reader to cook and film together. In the evening we had a wonderful potluck meetup with my super-passionate readers in the Philippines. The recipe is very simple and the taste is awesome. I’m always interested to learn recipes from different cultures, so I made my own chicken adobo when I got back home to New York. It was delicious! In a mixing bowl, create the marinade by combining the crushed garlic, ground white pepper, vinegar and bay leaves. Add the chicken to the marinade and let it sit for about 30 minutes. Heat up a pan and add the vegetable oil. Add the chicken pieces and saute until they’re brown on all sides. Save the marinade for later. Add the coconut milk and the marinade to the pan, and cook for 20 minutes over medium heat until the liquid thickens. Remove excess fat from the pan with a spoon. 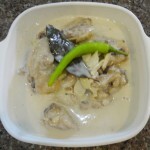 Add the coconut cream and green chilies and cook over low heat for another 5-10 minutes until a creamy sauce is formed. Add salt and fish sauce. Posted on Thursday, March 1st, 2012 at 2:32 pm. Last updated on April 26, 2015. Posted August 1st, 2014 at 8:53 pm | Log in to reply. Wow, I’m half Filipino so I’ve eaten a lot of adobo, but I didn’t know there was a white, creamy variety. I definitely want to try this. Posted November 5th, 2013 at 10:45 am | Log in to reply. Hi Maangchi! I’m a Filipina. I’m your fan! I loved korean foods especially jjampong, Soondubu jjigae, Sujebi, and of course kimchi! I always watch your videos in youtube it makes me salivate!!! Then while I’m browsing your recipes I’m shocked and feel proud that you featured a filipino food in your website. OMG your the best Maangchi! Posted March 14th, 2012 at 10:09 pm | Log in to reply. Chicken Adobo but it is different from the Adobo cooked in a thin brown soy sauce and vinegar. It has coconut cream that made the Adobo really tasteful. 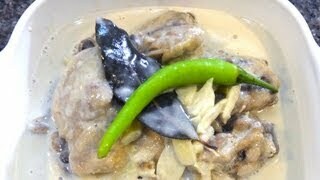 I want to try this new version of Adobo for my family.Thanks for the recipe. Posted March 12th, 2012 at 9:16 am | Log in to reply.
. im so happy when you featured a filipino dish in your channel and site. i hope this will not be the last :) thank you!! hope you come back again here!! Posted March 8th, 2012 at 4:15 pm | Log in to reply. I am thrilled to see your post on the chicken adobo. Depending on your family tradition and the region where you came from, there are hundred versions on how adobo is cooked. The most common version is cooked with soy sauce instead of coconut milk. I do enjoy both versions. My suggestion to those who cannot have access to cane vinegar is to dilute the white vinegar with water. When I first came here in the US (like you, I reside in NY), I used the white vinegar. I am sorry that you did not get good accommodations during your stay in Manila. I hope the Filipino spirit more than makes it up for you. I am sure had you asked for recommendation from local followers, you would have had better place to stay. I would like to request if you can post a recipe for white kimchi. I’ve seen it a lot of Kdrama that I am very fond of watching. Thank you and good luck on your future projects. Posted March 6th, 2012 at 6:32 pm | Log in to reply. does adobo supposed to be sour due to the vinegar ?? how is the taste supposed to be ?? i am making this tonight for dinner . I didn’t use cane vinegar , instead i used white vinegar , but i found it very sour . So i was wondering is it supposed to be that way ?? Posted March 6th, 2012 at 11:28 pm | Log in to reply. Posted March 8th, 2012 at 3:26 pm | Log in to reply. I have a very good Filipino friend who says that coconut vinegar may be less sour. I use rice vinegar in much of my cooking because of its mildness. Posted March 5th, 2012 at 11:25 pm | Log in to reply. One of my favorite. Im follower of your sites i just already now register. Posted March 3rd, 2012 at 9:59 pm | Log in to reply. I’m half Filipino and my mom’s adobo is made in a thin brown sauce with anise and hard boiled eggs like you make in your jangjorim. This version looks so yummy as well! I lived in the Philippines for two years when I was quite little and I miss all the food there! Posted March 2nd, 2012 at 9:39 am | Log in to reply. Posted March 2nd, 2012 at 7:34 am | Log in to reply. Oh Maangchi this looks absolutely delicious! Posted March 1st, 2012 at 6:21 pm | Log in to reply. Wow Maangchi, this looks great and very tasty. Might as well try this tomorrow ;). Posted March 1st, 2012 at 3:00 pm | Log in to reply. Hi Maangchi! I’m back! Sorry I’ve been busy…. Baby is now 10-months old. Anyway, I saw your post on FB and I wanted to congratulate you for learning to cook Adobo. Looks so yummy!!! Kudos to you and your Adobo. Posted March 2nd, 2012 at 9:26 am | Log in to reply. Joyce, yes I remember your adobo blog! The recipe was handed down by your father! “..when I was little and we had a school field trip for Girl Scouts, my Dad would cook adobo so I can pack it for our lunch…” Food is closely tied to our memories! This recipe was originally posted on March 1, 2012 at 2:32 pm by Maangchi. It was last updated on April 26, 2015. The video was watched 163,809 times on YouTube & has 2,263 likes!